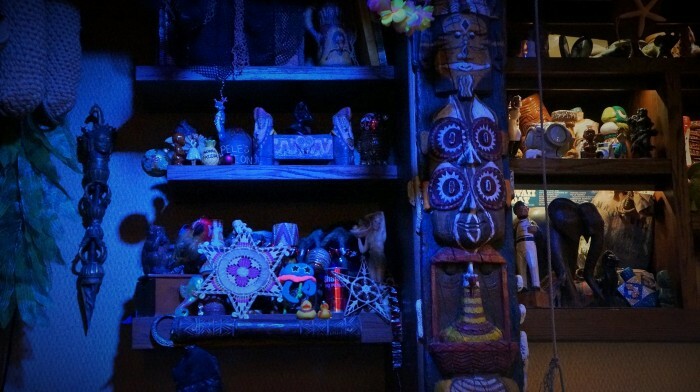 When Trader Sam’s Grog Grotto was announced one of my items on my wish list was that this location would get into the tropical holiday spirit in the same manner as the original Trader Sam’s Enchanted Tiki Bar. 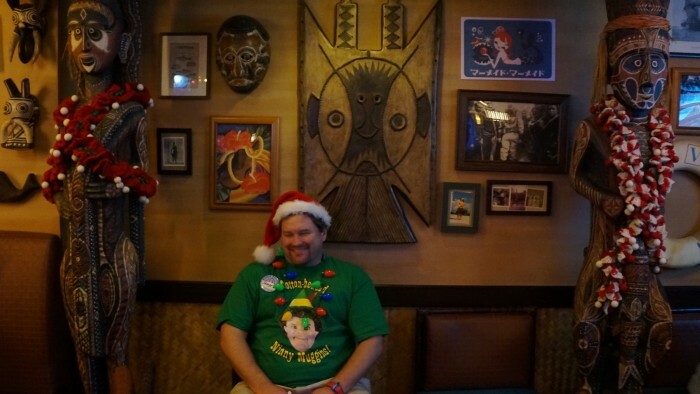 I am pleased to say that holiday decorations at Trader Sam’s Grog Grotto are now up and ready for all to enjoy. Here’s some highlights of the decor and special effects. The holiday spirit is contained within the Grog Grotto itself; the lovely outdoor Tiki Terrace does not have any decorations and remains a tranquil oasis. The live musicians may occasionally throw in some Hawaiian holiday music every so often, however, making for a nice evening. Once inside you will find strings of glowing Christmas lights and other festive decor. 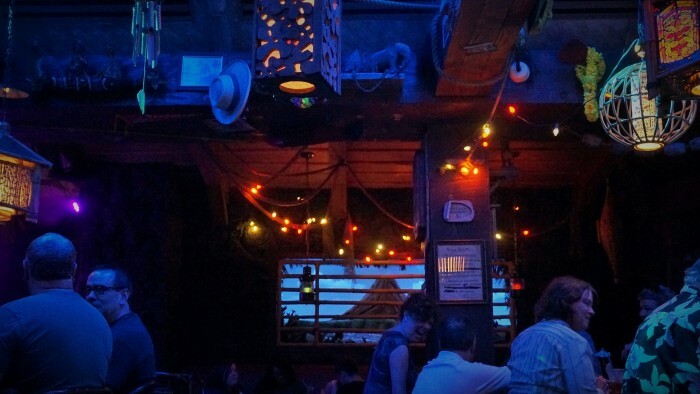 It is a bit mish mosh and tacky, but it fits the silly yet somehow authentic vibe of the Grog Grotto. The Christmas lights strung without much care are the first to catch your eye. After taking it all in, the large classic, plastic Santa Claus face hanging on the rafters with a cluster of tinsel is sure to be the next thing you’ll see. 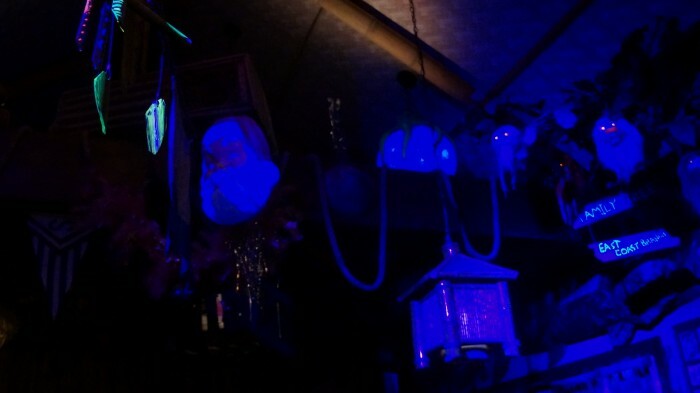 When someone orders a Shrunken Zombie Head drink, Santa becomes one of the many glowing objects. Speaking of effects, I’m a fan of the enchanted windows with views of volcanoes. Now that the holiday season is upon us snow gently falls. This alone is enough to make me smile. However, when someone orders a Krakatoa drink the volcano blows, but it does so with a stream of frost (Elsa would be so proud). The skippers call is a snocano! The bar is one of the places that is chock full of visual treasures. 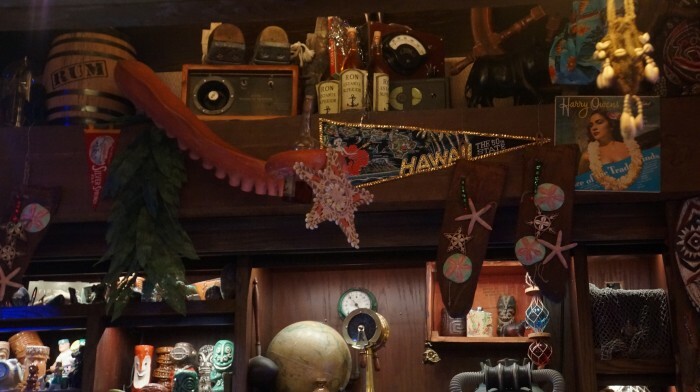 There are so many pieces of tiki memorabilia displayed on the shelves behind the bar. 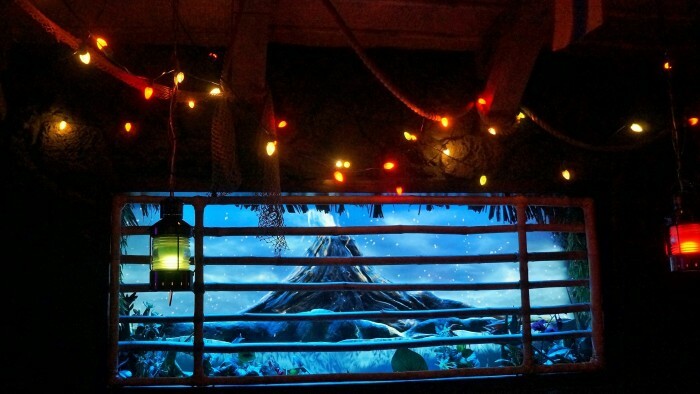 The holiday decorations that have been added to this area are simple, appearing as though they were made using materials found on an island. There’s a Star of David as well as simple stockings made of natural materials. Finally, in the back, underneath the mighty tiki goddess Uh Oa, you’ll find two tiki totems now adorned with festive leis, appearing as though they are made from ugly Christmas sweaters. This makes for a great photo opportunity if the seating area is open, or if the current occupants of said seating area are friendly. 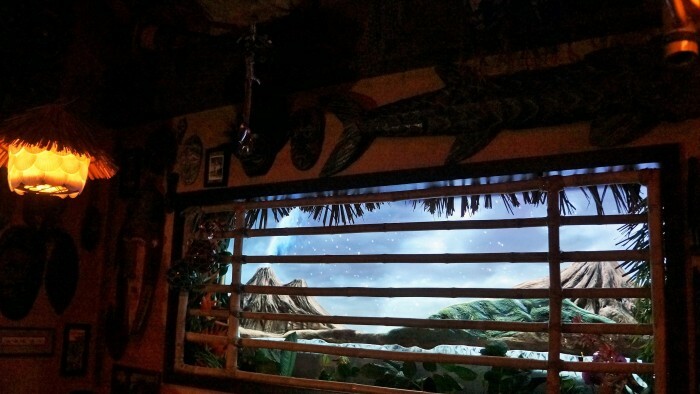 Overall it is a little disappointing that Trader Sam’s Grog Grotto did not receive a special delivery of seasonal cocktails like those offered at Trader Sam’s Enchanted Tiki Bar. On the West Coast there are three Christmas cocktails to enjoy; you can read about the two more popular drinks: the Red-Nosed Zebra and the Mele Kaliki-Mocha, including their recipes, here. 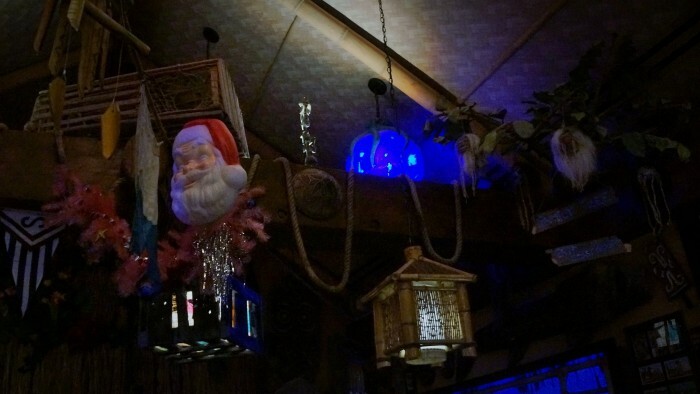 Despite the lack of seasonal drinks, anyone who is a fan of the Trader Sam’s experience is sure to enjoy the little festive touches added to the Grog Grotto. The Skippers offer their season’s greetings too, so yule surely have a good time! 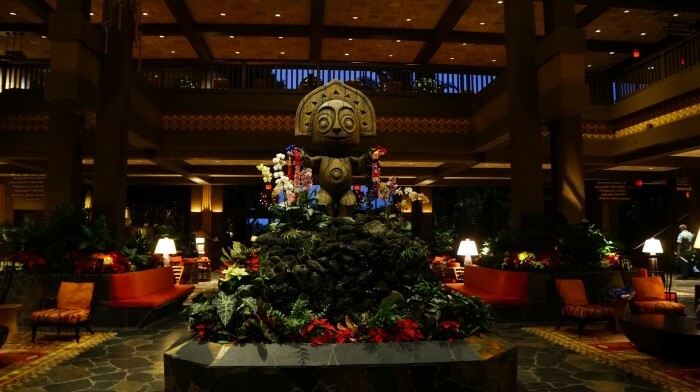 If you enjoyed this post my name is Dani and I invite you to check out my other two posts about Trader Sam’s Grog Grotto. 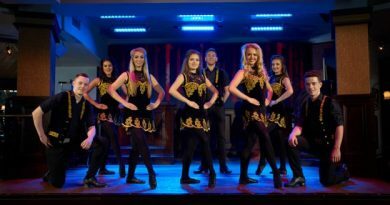 If you did not enjoy this post, well…. cheers, have a magical holiday season anyway!